Skydiving is really the face of extreme air sports the world over. It’s been popular for many years and yet few people have enough courage to really take it on. While it’s quite an expensive extreme sport, it can be life-changing and really provide the avid adrenaline junkie with everything they could possibly want to feel in one experience. There are so many places around the world that serve as perfect dive sites but one of the best is Houston, Texas. Let’s take at look at what makes this the perfect place to skydive as a novice or even as someone who’s been doing it for years. No matter who you are, Texas can provide you with one of the most incredible experiences of your life! Skydiving is a risky extreme sport no matter where you go but Houston has a reasonably low death rate from the sport. This is a clear indication of the kind of professional and meticulous practice that keeps divers safe and able to enjoy this incredible country. The area itself is extremely beautiful with vast farmlands and the open spaces that we no longer seem to find. The magnificent Eagle Lake is found west of Houston and gets its name from the Bald Eagles found in the area. It is possible for you to see these eagles towards the end of your fall and ironically from a bird’s eye view. You can go skydiving in Houston pretty much all year round. However if bad weather is expected you may have to reschedule your date as the companies will not want to put your life in danger. During the cooler months of the year, I advise wearing warmer clothing under your clothing as the air gets cooler the higher up you go. July and August are clearly the months when your skydive is more likely to go as planned. I also advise booking your skydive in the early morning if possible (between 8 and 10am). This is usually the time when Houston experiences the best weather, and this will of course make for a fantastic photo or video opportunity. If bad weather is experienced during this time, everyone will have to wait to dive. If you are booked in early and you miss your chance due to the weather, you will be the first to dive when the weather clears. 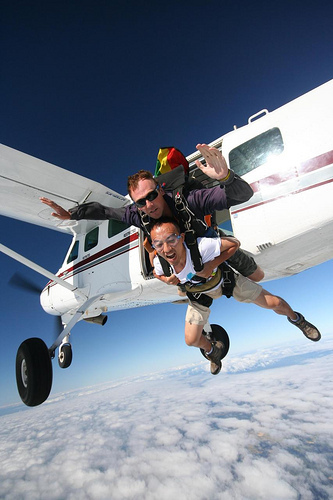 Skydive Spaceland is one of the most popular skydiving companies in the Houston area. They provide full support from start to finish and help you get set up with training and gear. For your first 2 jumps you’ll have to go with a tandem partner but after that they give you the option of diving-solo at a much cheaper price. They are also registered with regulatory bodies who set safety regulations for the sport. You can find their website here. 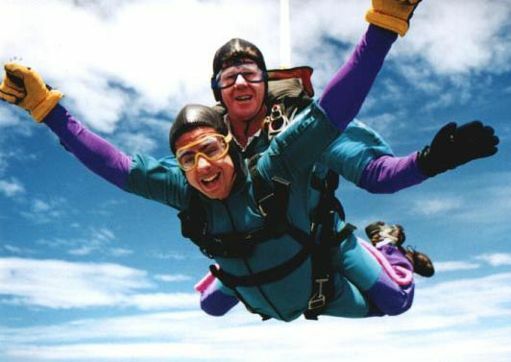 Skydive Houston are another well-established company who offer all skydiving and related facilities. They have tandem instructors who have done over 5800 jumps (like Bob Hunter) and are well qualified to take along passengers. Skydive Houston show you how to really see sites like Eagle Lake and the surrounding farmlands. In fact, it’s not uncommon to run your toes along the water as you fly to the shore. Both companies have hang areas where family and friends can entertain themselves while you risk life and limb. You can find their website here. 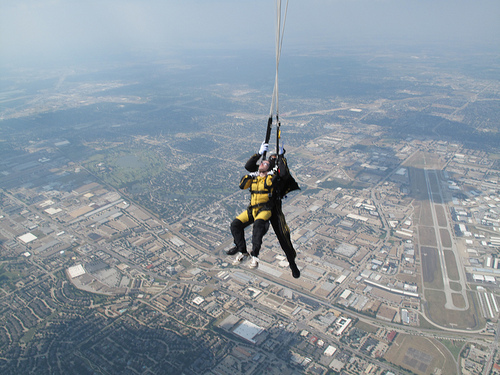 Skydive Dallas is great if you’re heading to North Texas. They have state of the art planes that can get you to the drop zone in thirteen minutes flat. They also drop you from higher than most skydiving companies at 13,500 feet which is almost unfathomably high. You can find their website here. If you are thinking about skydiving in Houston for the first time, you should know that most companies will require you to be at least 18 years old. If you are over 65 or have had any health problems you will need to speak to your doctor before you dive and receive a written medical clearance statement from him/her. There are also weight limits for almost all sky divers with 270lbs usually being the limit for tandem dives. You can expect to pay around $200 for one tandem sky dive and $150 for one solo sky dive in Houston although many companies will offer discounts if you skydive regularly with their company or if you are diving as part of a group. If you would like a video or a photo of you during your sky dive (which I definitely recommend) you may be charged extra for this depending on the company. Likewise if you have any of your own equipment you may receive a significant discount on the price of your dive. Most, if not all of the Houston companies will include the rental equipment in the price of your skydive. However you surely want to look cool before and after your jump. If you are truly interested in participating in this sport on a regular basis, why not invest in a novelty t-shirt and show the world how proud you are to be a skydiver. Below are some of my favorites. All in all Houston provides one of the most up-to-date and state-of-the-art facilities. The experience is there, the terrain is perfect and the views are amazing. Houston is perfect for both beginners and advanced sky divers so don’t pass up on an opportunity to skydive in Houston and experience one of the most vast and diverse terrains in the world. This entry was posted in Air Sports, Sky Diving, Texas, Travel, United States and tagged Houston, Sky Diving, Texas. Bookmark the permalink.